When not wearing a protective mouthguard, 60% of athletes are more likely to experience major damage to the mouth and teeth? Mouthguards which are bought at sports stores without any individual fitting, provide only a low level of protection, if any. If the wearer is rendered unconscious, there is a risk the mouthguard may lodge in the throat potentially causing an airway obstruction. Mouthguards help absorb most of the shock if a person receives a direct blow to the mouth. Mouthguards protect the teeth, gums and the inside of the cheek. Mouthguards can reduce jaw damage and concussion as well and help the wearer avoid costly oral surgery. 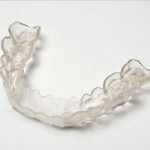 In addition, mouthguards can be effective when protecting teeth from bruxism (teeth grinding). Bruxism wears down the enamel, makes your teeth more prone to cavities and can cause jaw, head or shoulder pain. If you play contact sports or suspect you grind your teeth, contact Metroplex Dental Centre at Metrotown in Burnaby for an appointment to fit a custom mouthguard today. This entry was posted on May 31, 2012. It was filed under blog .